Five of the world’s top 10 tennis players made headlines all last year for the wrong reasons: hip surgery, tennis elbow, bad wrist, knee injury. But tennis players battle nerves on the court as much as they do physical injuries. Mantosh ‘Monty’ Basnyat realised that early in his career as a high-school circuit tennis player in the United States. Having suffered his share of frayed nerves, he now coaches students at his tennis academy to overcome them, even while training them to make the right moves. “The 20 seconds that players get in between points is crucial. If you don’t know how to stay in the present, separate private thoughts from the game, and focus on strategy, you are most likely to lose,” says the 48-year-old tennis director of the Park Terrace Tennis and Swim Club in Sacramento, California. Basnyat was five years old when he started hitting balls on the walls of a garage at the office in Kathmandu of his uncle Singha Bahadur Basnyat, himself Nepal’s national tennis champion for two decades in the 1960s-70s. Basnyat recognised his nephew’s talent and got him to the US to learn English and tennis. Monty Basnyat continued with tennis through high school, where he finished with a top-ten ranking in the Boys 18 category. After graduating with a business degree from the University of California in Riverside in 1991, he was offered a part-time job as a tennis instructor. More than 20 years later, he has successfully combined running a business with the game. His academy has students ranging from 2.5 years to 22, all of whom keep a journal where they write about their performance goals before each match and grade themselves after the match is over. The students are made to play sets with adults for better practice and to improve their game performance. In weekend tournaments, adults and children play against each other, since Basnyat says mental toughness is more important than physical attributes. “Tennis is about having character: discipline, resilience, confidence and mental strength. More than teaching tennis, I try to instil good, strong characters in my students, who may decide to stop playing but will carry lessons for the rest of their lives,” he says. 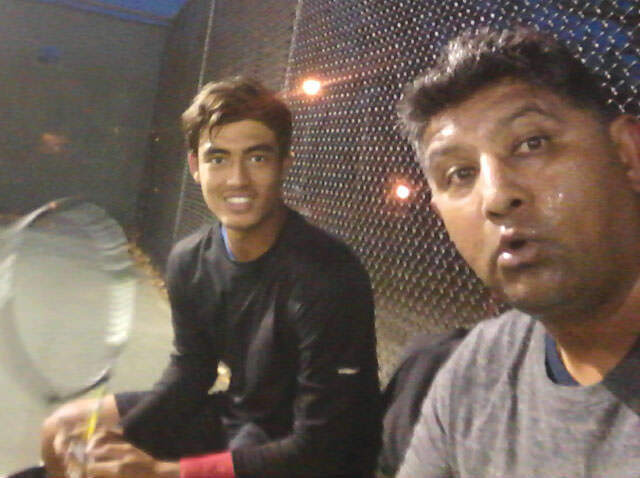 Mantosh Basnyat (right) met Abhishek Bastola (left) for the first time at his tennis clinic in 2009. 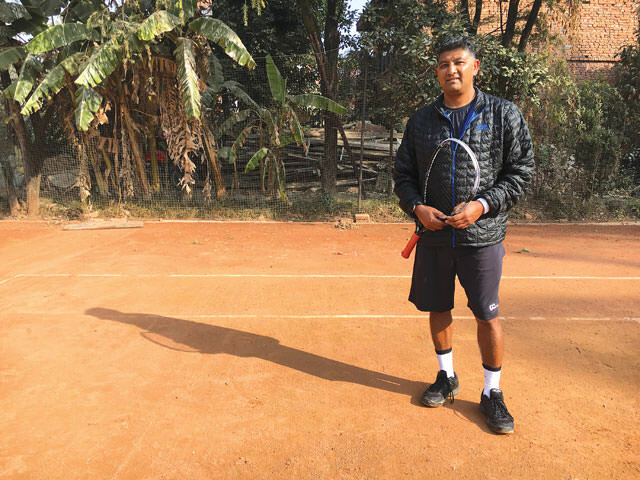 Bastola is now a national tennis champion and trains with Basnyat in Sacramento every few months, for help with his game, mental focus and confidence. Basnyat visits Nepal often, during which he conducts tennis clinics for young Nepali enthusiasts. Once in 2009, as strikes and curfews dragged on for days, organisers of tennis training took Basnyat to Pokhara, hiding him in an ambulance. That is where he met an eleven-year-old named Abhishek Bastola. Five years later, Bastola found Basnyat through Facebook and after training in Sacramento now has a division one sports scholarship at ASA College in Maimi. Bastola, who also receives support from other US-based tennis coaches like Sujay and Raj Lama, bagged the men’s singles category title at Nepal’s own 14th National Lawn Tennis tournament in Satdobato last November without dropping a set throughout the seven-match event. The proud coach says Bastola’s talent is supplemented by his realisation that tennis is a mind game, but Basnyat is disheartened to see young tennis talents in Nepal without a platform to perform. "If your stomach hurts, is it the king’s fault?"